I have spent a lot of time in the last few months trying to figure out how to configure my Apple watch infograph watch face. This watch face certainly brings to mind the old warning about being careful what you wish for. For so long I've been looking for a watch face with many complications and now Apple has given it to me. The problem is, I made a big mess out of it. My first attempts involved using all of the available complications. If it was shiny, I put it in. The trouble with that is the complications surrounding the watch hands tend to blend in with the watch hands. As a result, when you glance at your watch, sometimes it is difficult to tell what time it is. Ultimately, I decided that complications in the center of the watch face were generally a bad idea. The only exception I made for that was the calendar watch face. I hyper-schedule my days... still. I like having appointments set up for my next tasks and I run these all day. I frequently look at my watch to see where I need to go next or what I need to be working on next. Having the calendar available and the next event written across the top of the infograph face is quite useful. For that reason, I have been leaving the calendar in the center complication, but that's it. The rest of the center of the watch face is blank. Making it easy to read the watch hands. The idea of this watch face is to create something for use during the day while I'm trying to be productive. I have a separate face that I use for my workouts. I did not include any health-related information on this watch face. Instead, I knew I wanted to use the drafts and OmniFocus complications. The trouble with these complications is that they add text along the rim of the actual watch face. With OmniFocus, it gives you your next task, and with drafts, it gives you your inbox count. I don't want that across the top of the watch face because looking at those words on top of the next appointment makes a jumble of letters that again is difficult to read as you're getting through your day. As a result, I decided to put the OmniFocus in drafts complications in the bottom slots. For a while, I tried the watch just like this with no additional complications across the top, but it made the watch look bottom heavy, and I do love complications. As a result, I decided to put some additional complications across the top of the screen. I don't want words combining with my next appointment, a condition of any complication going across the top of the screen is that it'd not have words across the bottom of it, but instead a line or some other graphic image. Ultimately, I decided on the timer and CARROT weather. I use timers all day for things like the Pomodoro Technique or just checking on the water in the garden. This one has already been a winner for me on my day to day watch face. I'm not sure about the need for a weather complication. I live in California, and the weather is generally pretty mild. I don't need a minute by minute update of what the temperature is. 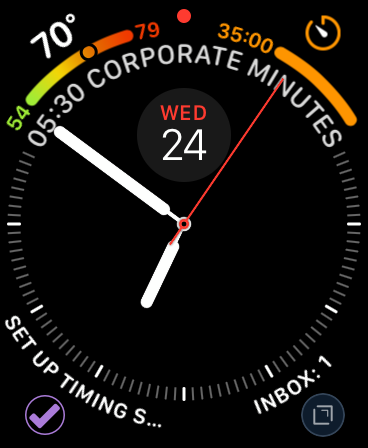 I am, in general, pretty happy with this setup for the Apple infograph watch face. I am, however, still not entirely convinced it's any better than the Siri watch face. I used the Siri watch face all of last year, and it generally gives me the information I need when I need it. I am disappointed that it hasn't done a better job of servicing third-party application information as we were promised with iOS 12. While I'm giving the infograph face a real try here for awhile, I can't promise I won't ultimately end up back on the Siri watch face, particularly if it gets better at third-party integration.